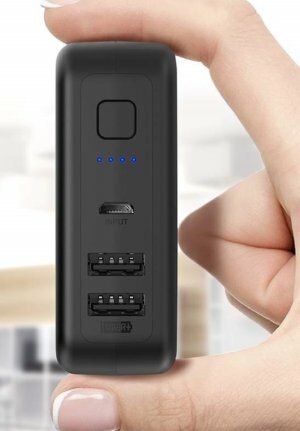 The $27 RAVPower 6700mAh External Battery Pack fulfills its promise of providing a single wall adapter, two USB ports, and a portable battery pack all in a tidy design. 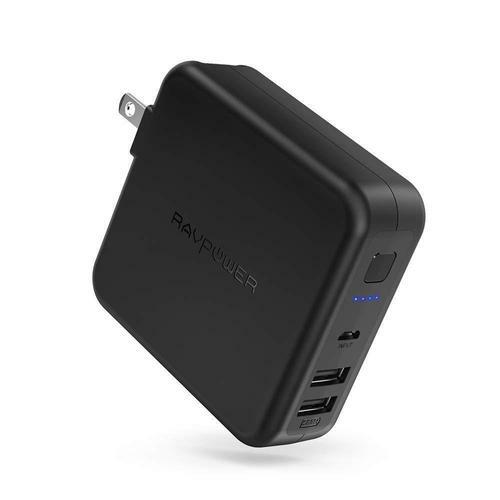 The pack is very similar to Anker’s Powercore Fusion 5000, only RAVPower’s fails to deliver in overall performance and has one design quirk I just can’t look past. Included in the box are a carrying case and a mircoUSB cable. The square footprint of the pack easily fits into a backpack or purse. On the front of the pack you’ll find two USB ports, each one capable of 5V/3A of output, or 5V/2.4A max output when you’re using both ports at the same time. There’s also a single microUSB port for charging the battery pack itself, four indicator lights, and a power button. A power button, microUSB, and two USB ports occupy one side, while a pair of outlet prongs are on the other. On the backside of the pack are the standard wall outlet prongs, which makes charging the battery pack convenient since you simply plug it into the wall and don’t have to fuss with finding a charger for your charger. But, this is where the design of the pack frustrates me—the outlet prongs are difficult to fold out of the battery pack. There isn’t any sort of button, switch, or lever to make it easier to rotate the prongs in either direction. In fact, at times I’ve had to resort to using a pen to get under a prong to move it. As for overall performance, the pack has a 6,700mAh/24.12Wh capacity. In testing, we were only able to get an output of 15.72Wh or 65.17 percent of the total capacity. That’s the lowest efficiency of any battery pack we’ve tested, and it’s not even close—the nearest efficiency percentage is 72.71 percent, with an average score of 84 percent for all packs we’ve tested. Bottom line: Typically RAVPower products are some of the best, but this particular battery pack lacks an easy way to access the wall prongs, and its efficiency is the worst we’ve seen.